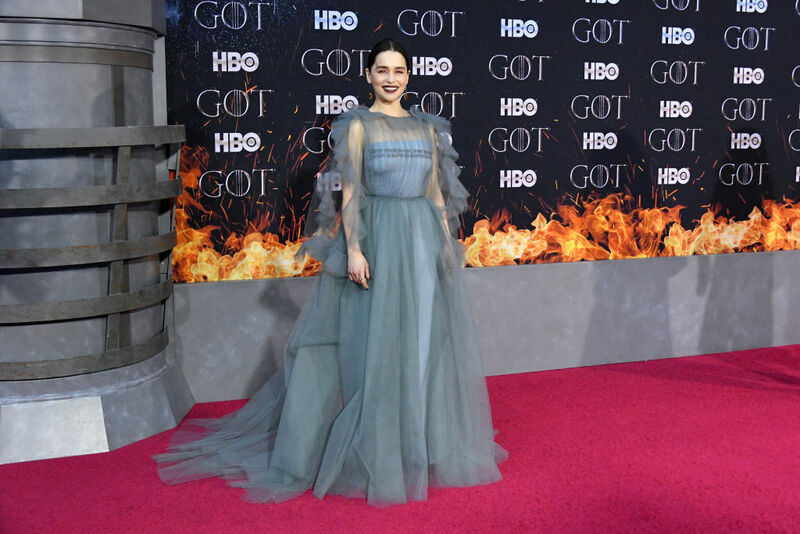 On April 3rd, 2019, celebs from all corners of the globe attended the eighth and final season premiere of Game of Thrones at Radio City Music Hall. While everyone is rightfully excited about the new episodes, we are very excited about all of the premiere fashion. We want to see what all these actors look like when they’re not getting ready to battle a horde of white walkers. 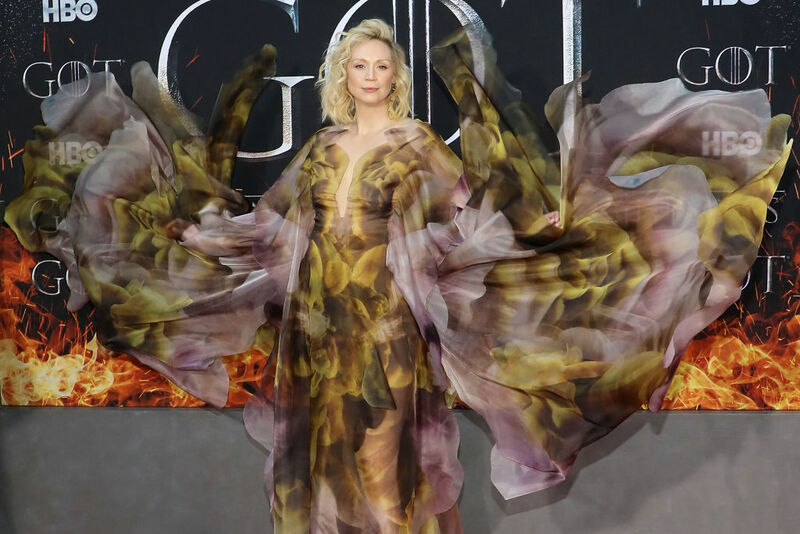 Keep reading to see Gwendoline Christie’s outfit, which I’m pretty sure is a song of ice and fire all on its own. Maisie Williams, AKA Arya Stark, showed up to the Game of Thrones premiere in this long tiered black gown. I’m loving the crystal detailing on all of those tiers, plus the neckline on this dress is so punk rock. That little cutout right under the bust line is a little bit daring, but not too much. 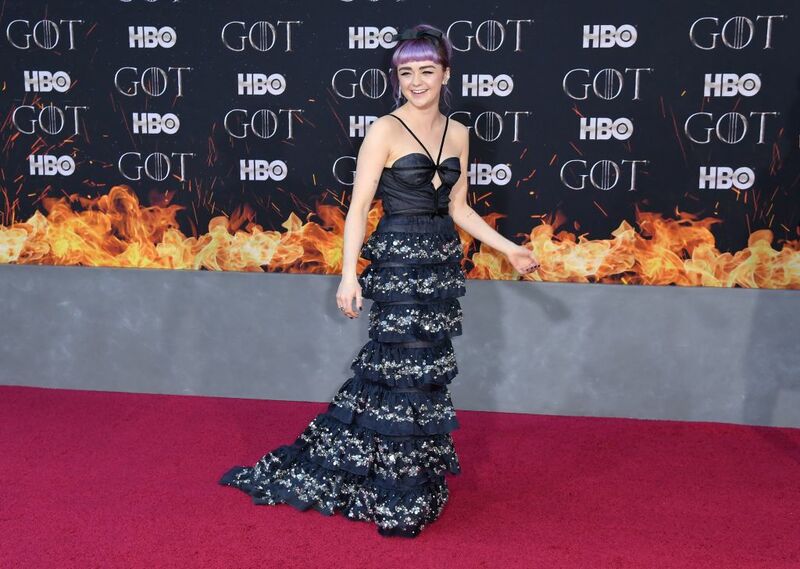 Maisie looks a lot different than she did at the first Game of Thrones premiere when she was just 14 years old. Now Maisie is almost 22 and she’s a full-grown lady. That purple hair looks great on her. What would Game of Thrones be without Kit Harrington, the man who brought Jon Snow to life (and then brought him back to life after he pretty much died)? 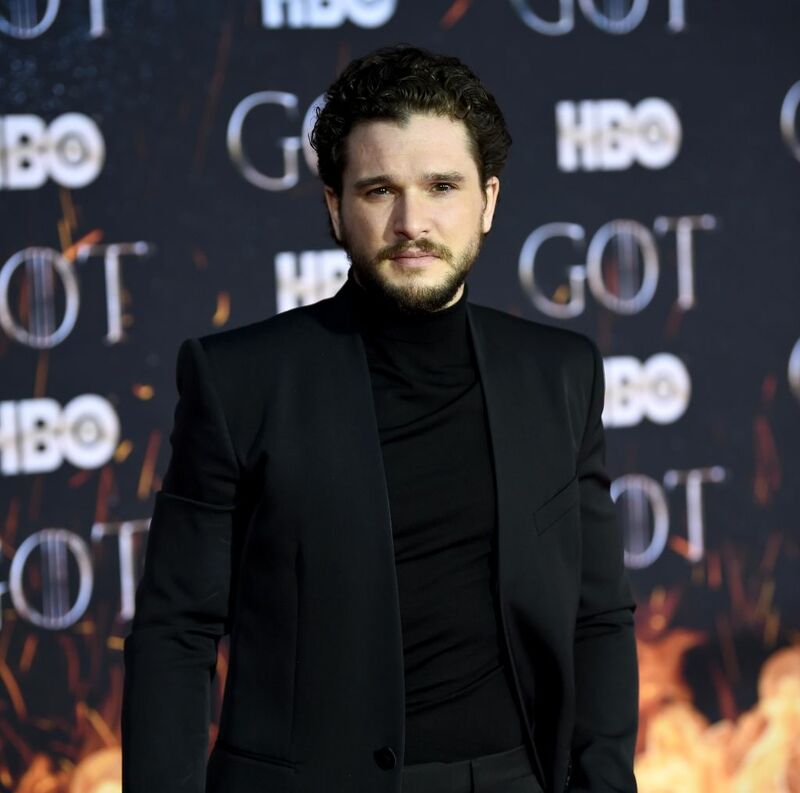 Kit looks super classy in this all-black ensemble. Do we think the black is foreboding? Could Kit be in mourning for his character? We’ll have to wait for the eighth season of Game of Thrones to come out to be sure. Keep reading to find out what Kit’s wife wore to the premiere. Rose Leslie played Ygritte on Game of Thrones. Ygritte the Wildling was Jon Snow’s love interest on the show, and then Rose Leslie became Kit Harrington’s love interest in real life. 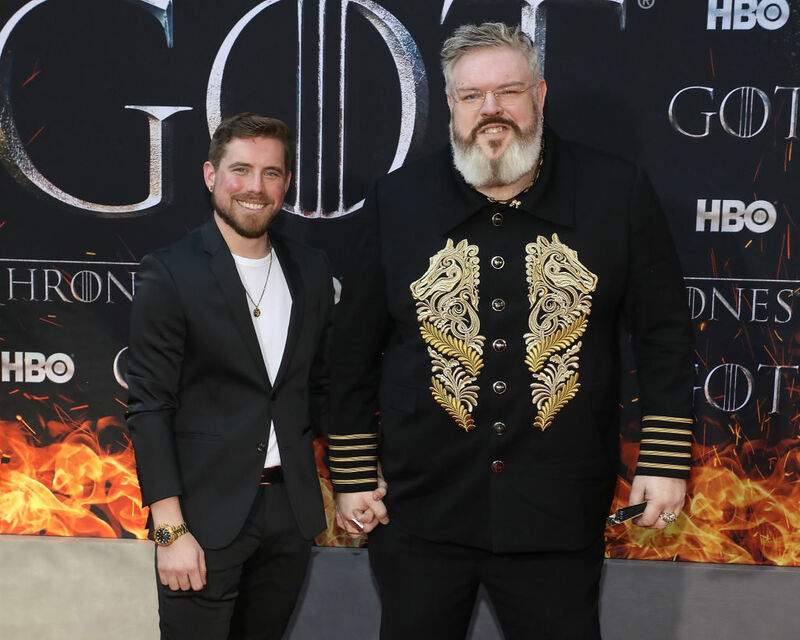 Kit and Rose got married last year, and they showed up to the premiere looking like a true power couple. Rose looks lovely in this bright red dress. She kind of matches the flames on the poster behind her. You know Aidan Gillen best as Petyr “Littlefinger” Baelish. 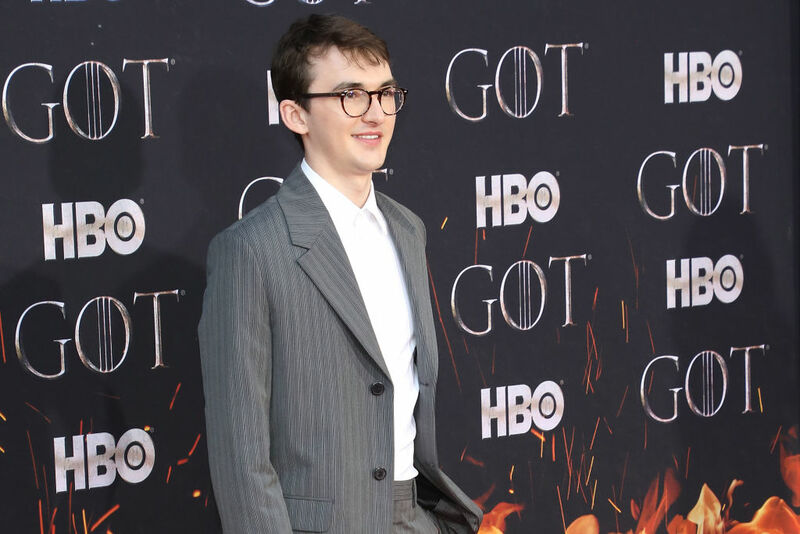 He won’t be appearing in this final season of Game of Thrones (because he already died in the show) but we love that he showed up to the premiere to support his former castmates. 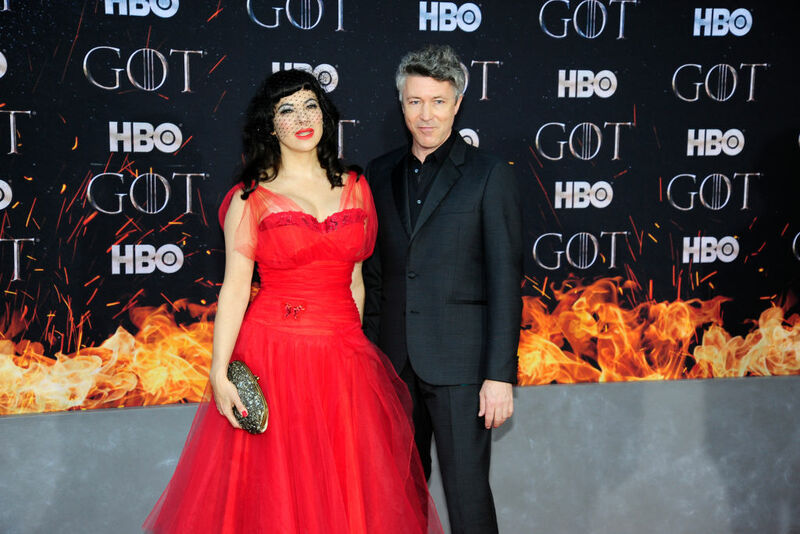 Aidan showed up to the event with his partner, Camille O’Sullivan, who is also an actor. Her red dress is a showstopper and Aidan looks very dapper in this all black look. They must be taking cues from Rose and Kit. Here he is, the man himself. George R. R. Martin is the brains behind this whole operation. He wrote the book series that the HBO show Game of Thrones is based on. We’re still waiting on that last book, George. Any idea when that might be ready? 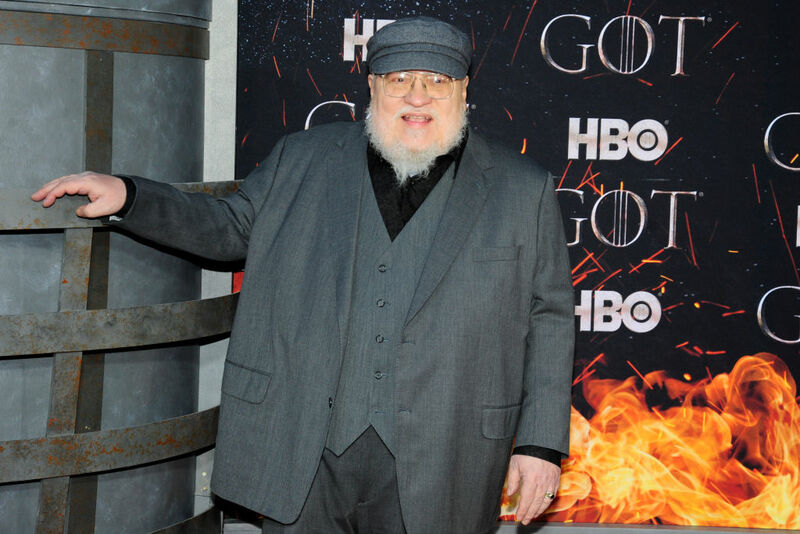 You’ll never see George R. R. Martin without a hat on, and on premiere night he matched his hat to a beautiful grey three-piece suit. 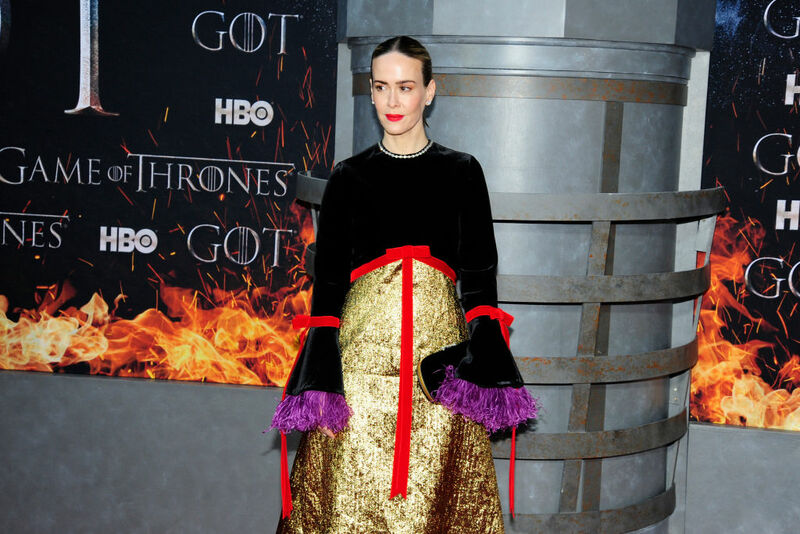 Sarah Paulson definitely looks fiery in this unique outfit. I love that her lip color matches the red ribbons on her dress. The high waistline is also very flattering on her. Sarah Paulson seems like the kind of actor who would be in Game of Thrones, but she was just at this event to support her fellow thespians. I hope she enjoyed the premiere, and I’m super jealous that she got to see season 8 before we did. Well, don’t these two just look darling. Can you believe that Joe Jonas got engaged to Lady Sansa? Well, he got engaged to the actress who plays Lady Sansa. Joe looks pretty stylish in that grey plaid suit, but it’s Sophie who stands out in that short black dress with silver embellishments. It looks like these two picked outfits that look nice together, which is an important thing to consider when you’re walking a red carpet with a significant other. Keep reading to find out which GOT castmember wore a very similar suit to Joe’s. 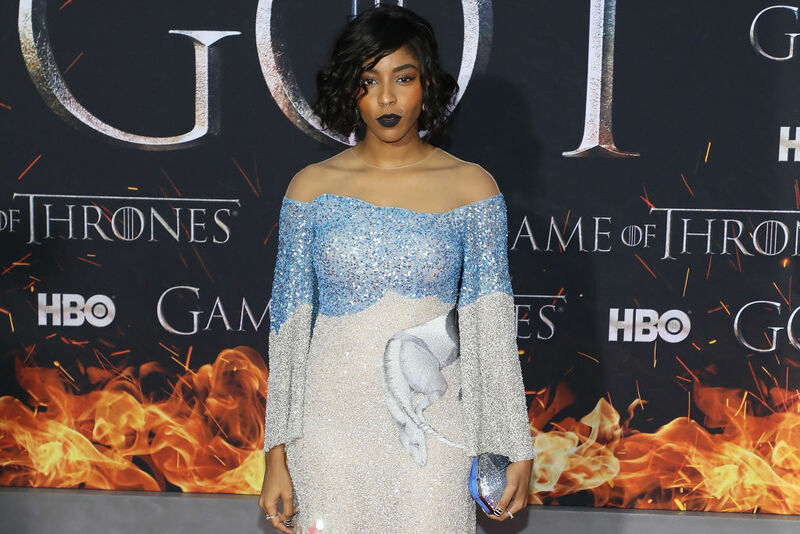 Does Jessica Williams have a unicorn on her dress? Because that is absolutely magical. You can’t really tell in this photo, but the bottom of Jessica’s dress is covered in pink sequins. She kind of looks like one of those tri-colored rocket popsicles. Jessica is definitely team ice, not fire in this outfit, but who doesn’t love an ice queen? That dark lipstick looks absolutely stunning on her. I can’t get enough of this look. Gwendoline Christie plays Brienne of Tarth on Game of Thrones. She’s definitely team fire in this Iris Van Herpen gown from the Spring 2019 couture collection. I don’t think I’ve ever seen Gwendoline look this good, and Gwendoline always looks pretty darn good. This dress really got the Twitterverse talking, so basically, when Brienne of Tarth walks the red carpet, people pay attention. The shoulder length hair looks great, Gwen. Keep up the good work. You probably know Kristian Nairn best as Hodor from Game of Thrones. Last season, we learned about Hodor’s tragic origin story, and we lost the beloved giant in an act of true heroism. Nairn walked the red carpet with his partner, and both of these men look super handsome. Nairn’s beard is expertly groomed, and that gold pattern on his jacket is giving me some major Elton John vibes. I’m into it. 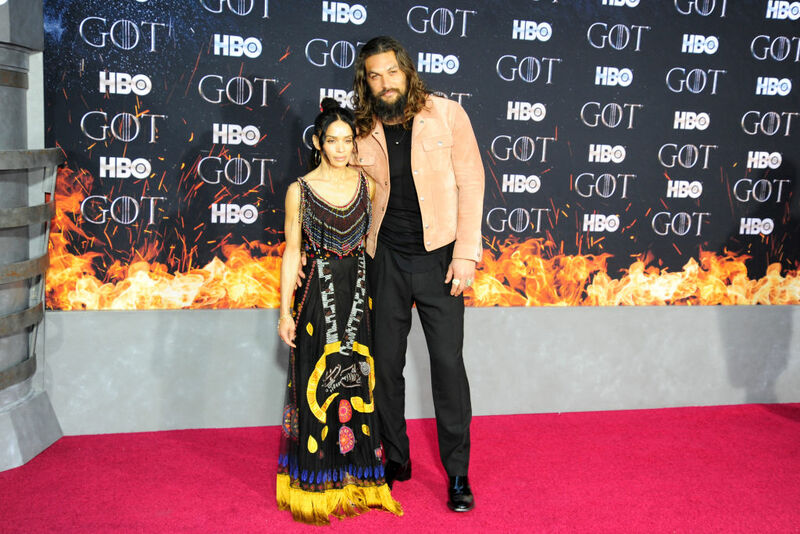 Jason Momoa and Lisa Bonet walked the red carpet in style. First of all, how are these people even human? If never seen humans this attractive, so they must have some really impressive genes. Also, Jason Momoa is out here proving that real men can wear pink— or salmon, or whatever color that is. Lisa looks stunning in this sheath dress, and I particularly love the golden yellow tassels around the hemline. Carice van Houten is a Dutch actress and singer best known for playing Melisandre of HBO’s Game of Thrones. I almost didn’t recognize her without the long red hair. This dress is so perfectly Game of Thrones, though. The detailing at the top of her dress kind of looks like dragon wings. 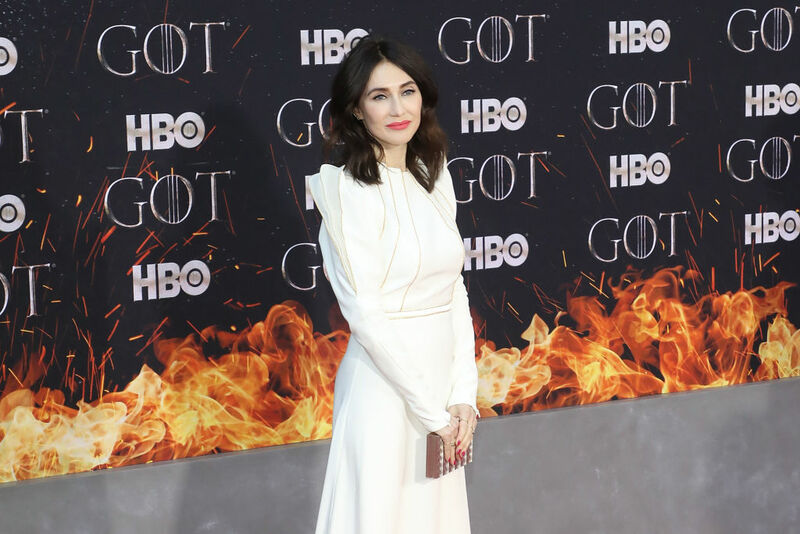 It looks like Carice is team ice tonight. We’ll have to wait to see the final season of the show to find out what happens to Melisandre. Here she is, Khaleesi, Daenerys Targaryen, The Mother of Dragons. I can’t really tell if Emilia is team fire or team ice tonight. Her dress is saying ice but her eye make up is screaming fire. Maybe she’s on both teams. This tulle soft blue dress looks amazing on Emilia. She looks like she’s floating down the red carpet. We’re going to have to wait until the end of season 8 to find out if Daenerys ends up on the Iron Throne. 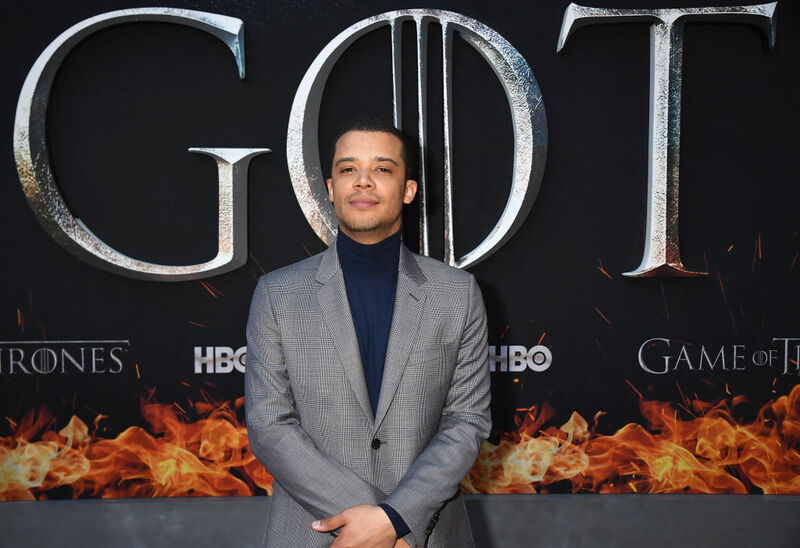 Jacob Anderson plays Grey Worm on Game of Thrones. Interestingly, Jacob is also a musician known as Raleigh Ritchie. His debut album, You’re a Man Now, Boy, was released in 2016. Naturally, Jacob wore grey on the red carpet, possibly as a tribute to his character, Grey Worm. His plaid suit kind of looks like Joe Jonas’ plaid suit, just without all of the zippers and leather straps. Who do you think wore it better? We’ve already talked about Jacob Anderson’s outfit, so let’s leave him out of this. 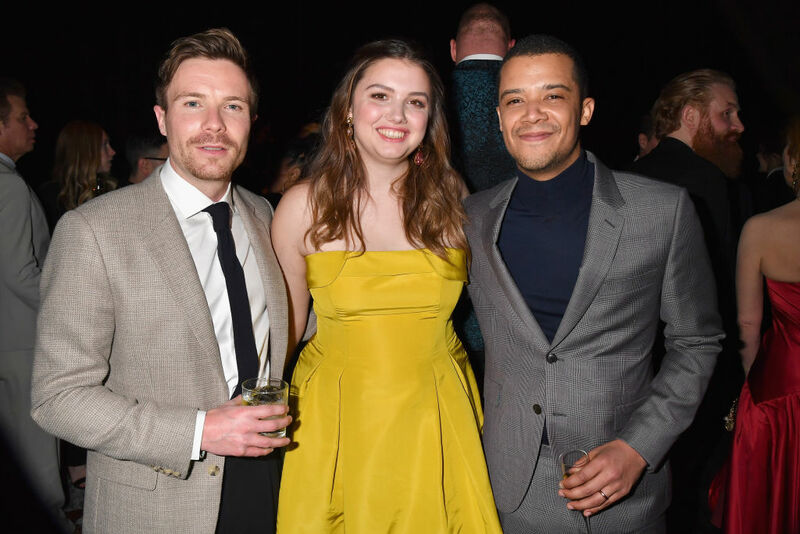 Can we talk about Hannah Murray’s yellow dress? Yellow is definitely her color. Hannah plays a wildling named Gilly in Game of Thrones. She becomes Samwell Tarly’s significant other. To her right (and on the left of the photo) is Joe Dempsie, the actor who plays Gendry in Game of Thrones. I guess very slightly plaid suits are a thing now. 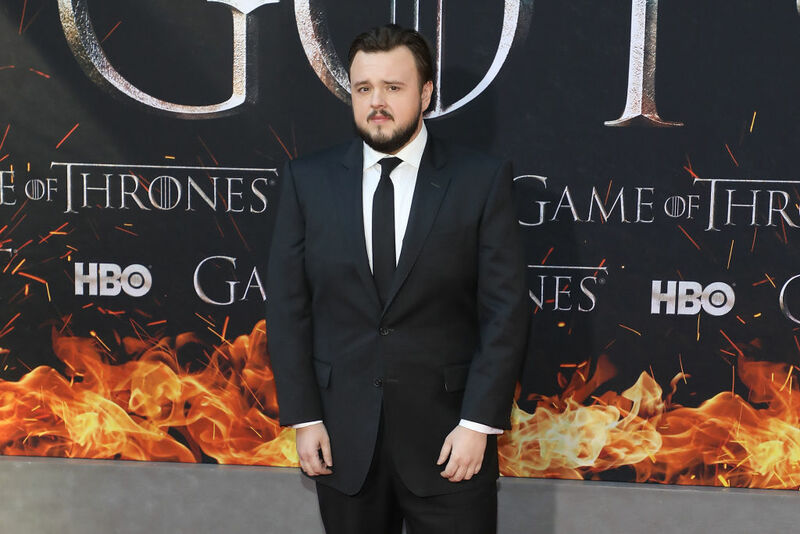 Keep reading to find out what Sam Tarly wore to the premiere. John Bradley plays Samwell Tarly in Game of Thrones. He chose a very classic look for the season 8 premiere red carpet. This is just your regular, run of the mill black suit with a very classy black tie. John’s beard looks very well groomed, but his face does look a little bit worried. Could this mean that Samwell doesn’t survive the final season of the show? Am I reading too much into this? 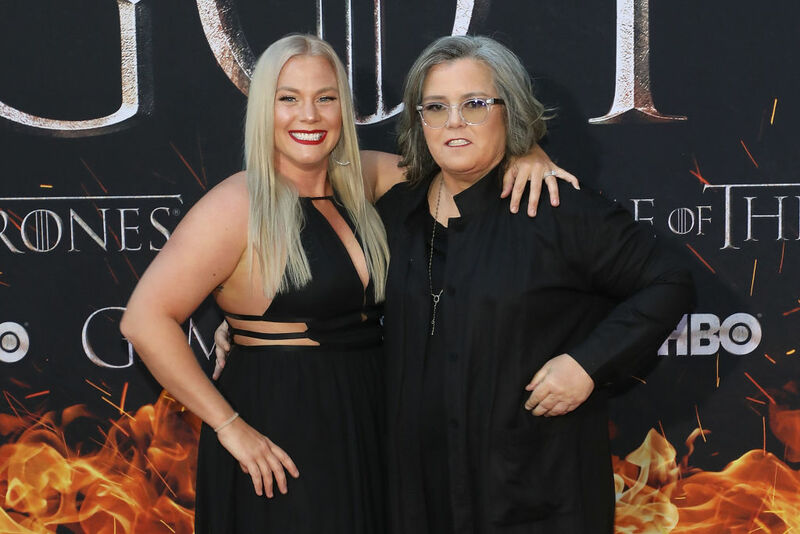 Rosie O’Donnell and her partner Elizabeth Rooney showed up to the Game of Thrones premiere in style. Rooney is O’Donnell’s girlfriend of a little more than a year. She’s a police officer with a military background. Also, she looks amazing in this very strappy black dress. Rosie is looking better than ever in this all black outfit. I think the grey hair actually suits her very well. I guess these two are huge Game of Thrones fans. Isaac Hempstead plays Bran Stark on Game of Thrones. I have a feeling that Bran is going to have a pretty major role to play in how the ending of this whole series goes down. Isaac looks a lot different now than he did at the premiere of the first season of Game of Thrones. Back when the first season came out, Isaac was only 10 years old. Now he’s 18. Alfie Allen plays Theon Greyjoy in Game of Thrones. He looks a little bit more confident here than he did on the show the last time we saw him. 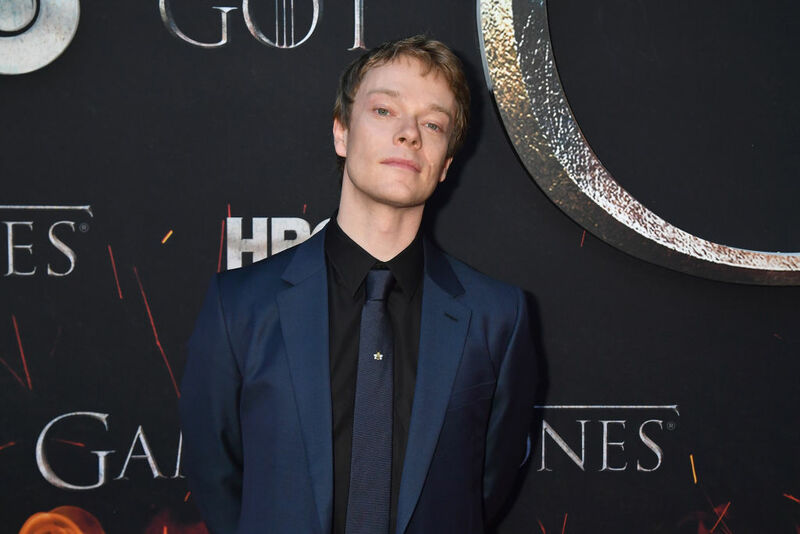 Theon is one of the most unusual characters on television, and I’m really excited to find out what happens to him in the final season of the show. Alfie looks very cool in this navy blue suit with a satin finish. I think the black dress shirt is a nice touch. 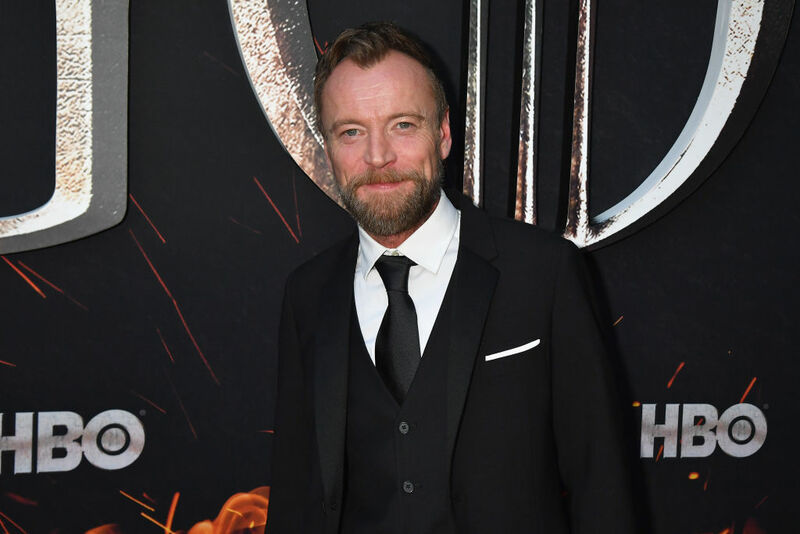 Richard Dormer is an actor from Northern Ireland who is best known for his role as Beric Dondarrion in the HBO television series Game of Thrones. Richard is wearing a very classic three-piece suit with a black necktie. He looks particularly happy to be at the premiere, and I can’t blame him. It must be hard to know how the series ends and not be able to tell anybody. I really don’t think that Natalie Dormer is related to Richard Dormer, but who knows, stranger things have happened. Dormer gained international attention for her performance as Margaery Tyrell in Game of Thrones. It looks like Natalie is on team fire today with those flame-like shapes in the top of her dress and her fiery red eye makeup. I miss having Margaery on the show. Too bad Cersei had to destroy her. Varma played the role of Ellaria Sand, Oberyn Martell’s lover on Game of Thrones. At the end of the seventh season, we left Ellaria alone in Cersei’s dungeon watching her daughter die and decompose. Who knows if we’ll see her again in season 8, but I kind of hope that we do. Indira Varma looks lovely in this hot pink, intricately detailed dress. It definitely looks like she’s on team fire. Keep reading to see what Sir Peter Dinklage wore to the event. 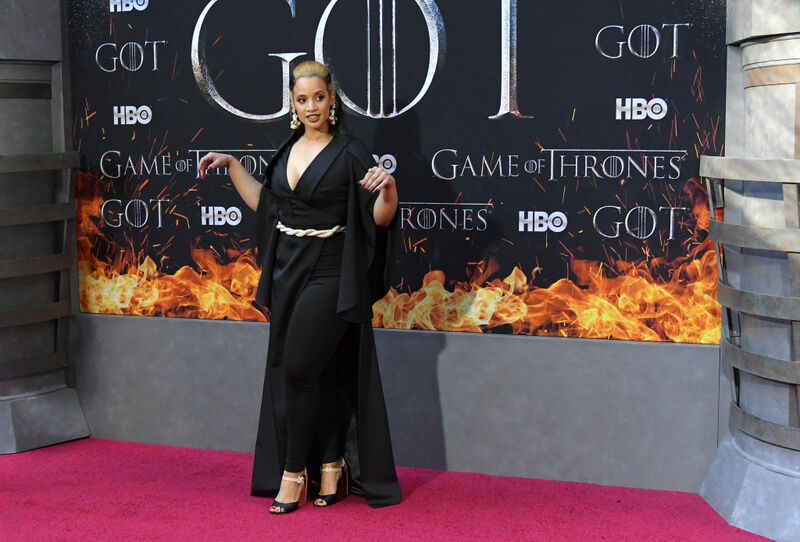 Dascha Polanco looks absolutely amazing in this black pantsuit cape combo outfit. Her stance and that twisted belt around her waist kind of makes it look like she belongs with the Sand Snakes. I’m loving Dascha’s two-tone hair and those huge statement earrings. I can’t tell if Dascha is team fire or team ice. Probably team fire judging by that gold belt. I swear, Dascha Polanco just gets more beautiful every time I see her. Esme Bianco is an actress, singer, and burlesque performer best known for her role as Ros on Game of Thrones. Ros is a prostitute in King’s Landing who first appeared in the series premiere “Winter Is Coming.” Unfortunately, Ros was killed off in season 3. Esme doesn’t have any hard feelings, though. She’s back for the season 8 premiere, and she looks absolutely stunning in this black and gold dress. 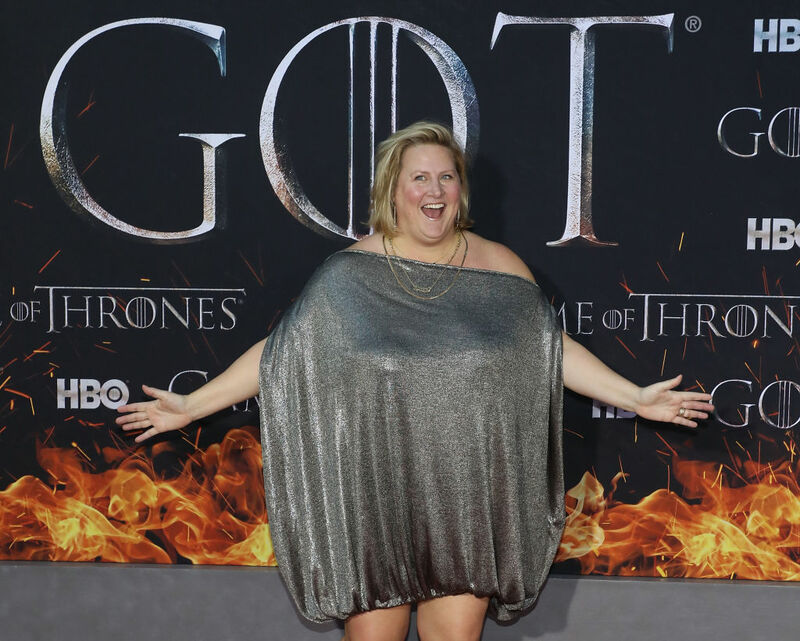 Comedian Bridget Everett showed up to the premiere of season 8 of Game of Thrones in what I think is a dress, but I can’t really be sure. I don’t think this is the most flattering look in the world. Bridgett kind of looks like a Hershey’s Kiss mascot. Maybe that was on purpose? Briget can wear whatever she wants. She’s a funny person and that’s all that matters. 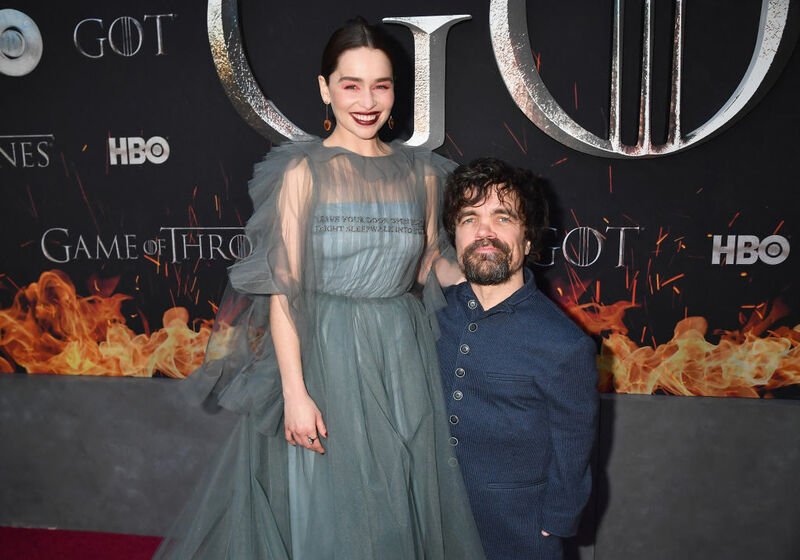 She looks pretty stoked to be at the GOT premiere. We already talked about Emilia Clarke’s outfit, so let’s move on to the absolutely dashing Sir Peter Dinklage. I really hope Tyrion makes it through season 8 alive, but I don’t know if that’s something I’m willing to bet on. Peter looks fantastic in this many-buttoned navy blue suit. It’s a totally unique look that almost looks like something Tyrion could wear in Game of Thrones. These two look so good standing next to each other. I can’t wait to see Tyrion and Daenerys together again. 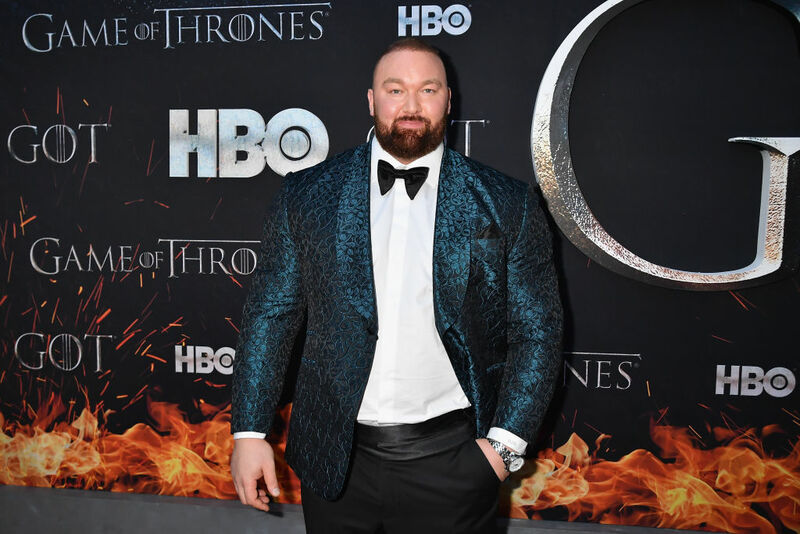 Hafþór Júlíus Björnsson is an Icelandic professional strongman best known for playing Gregor “The Mountain” Clegane in the HBO series Game of Thrones. Hafþór opted for a bowtie instead of a necktie because he knows that the premiere of the final season of Game of Thrones is a black tie affair, so he had to do his own thing. I’m loving this shiny teal suit on him. It stands out from the crowd just the right amount.